Pasta is a great child favorite and one that you can feel good about serving. 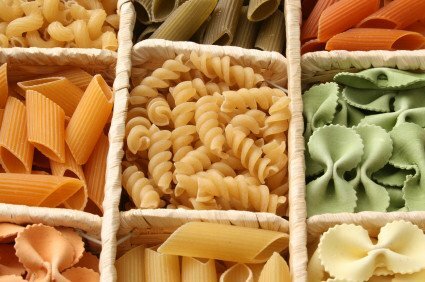 There are many shapes, brands, and types of pastas to buy. There has been a surge in recent years of whole grain pasta, and if you like it, by all means serve it. But, it may surprise you that pasta is not the same as bread. Unlike bread, pasta is made from semolina flour, which comes from durum wheat. When eating pasta, blood glucose absorption is much slower than when eating whole grain bread. This means that you won’t experience a large “spike” in blood sugar after eating pasta. Regular pasta has both protein and fiber. We recommend buying Italian pasta because under Italian law there must be a high percentage of protein in the pasta. Imported Italian pasta tastes good and is good for you. The best pasta for babies is easy to pick up shapes such as spirals. You are supposed to boil 5 quarts of water for a point of pasta. This can be time consuming if your stove is weak, and you might not have a big enough pot. You can get away with a gallon of water for a pound but if the pasta sticks together you should increase the water. After the water comes to a boil, salt it (use 1 1/2 tablespoons of salt for each pound of pasta). This improves the taste of the pasta. Bring the water back to a boil and stir it to keep from sticking. Cook the pasta until it is rather soft, but not so soft that it falls apart. Store in cupboard for a year or more. Yes. There are jars with pasta and sauce for toddlers. Making tomato sauce is easy and quick. You can make it in the time it takes to boil water and cook the pasta. But, if you decide to buy tomato sauce, try buying "Newman's Own" brand. This brand has less additives than other jarred pastas and a more fresh taste. You want to avoid added sugar in your pasta sauce. Heat oil and garlic in skillet over medium low heat. Cook, stirring occasionally, until the garlic is golden brown. Drain the tomatoes and squeeze them one by one over the skillet as you add them. Raise the heat to medium high and cook stirring occasionally until the tomatoes break down. Stir in salt and pepper.